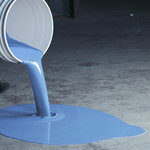 This anti-skid epoxy coating is used to coat a wide range of areas to help keep floors safe. The fine grit in this coating makes for sure footing and provides a surface equally suitable for bare feet and shoes. Tigertred™ is an ideal coating for shower rooms, pool areas and on balconies. USDA Authorized. Imparts a beautiful finish while providing enhanced traction and strong adhesion to concrete, wood and steel surfaces. Premixed formula contains a finely graded aggregate blend. Offers chemical and abrasion resistance. @ 70F: light traffic: 8-16 hours. Tigertred™ is approved for shipping to all 50 states by ground or air.